Last night, I finally tried a recipe I pinned months ago from Chocolate-Covered Katie, ”Homemade Krispy Kreme Doughnuts- The Healthy Version“. I am in love! Don’t be fooled by the title- they don’t taste like Krispy Kreme but they are so delicious and really easy to make. From prep to finish, mine took only about 45 minutes. I used almond milk for the doughnut mix and added a bit of cinnamon and nutmeg to the batter for a little extra flavor. I also opted to make a different glaze (recipe below). I was so excited to finally use the pans I ordered months ago when I first found the recipe! Here are some options of doughnut and mini doughnut pans if you don’t already have them. 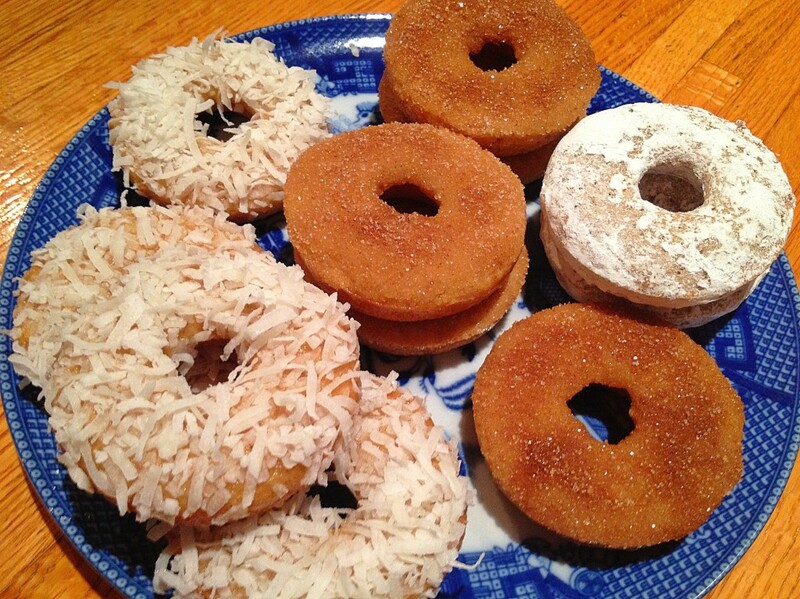 After the doughnuts cooled, I finished them 3 ways: Cinnamon Sugar, Coconut, and Powdered Sugar. For the powdered sugar doughnuts, just throw each in a ziplock bag with some confectioners sugar and shake. For the Cinnamon Sugar and Coconut, I dipped them in a vanilla glaze then flipped them on plates with cinnamon and sugar or shredded coconut and pressed until they were coated. The glaze was simple to make: I whisked together almond milk (you can use any non-dairy milk) and confectioners sugar until I got the consistency I wanted then added a bit of vanilla extract. These doughnuts are so light that it’s hard not to eat the whole batch in a day! Happy baking!